Enoki (Flammulina velutipes, penízovka sametonohá, Enokitake, golden needle mushroom) is one of the popular edible mushrooms. It grows throughout the northern hemisphere, i.e. it can be found in North America, Asia, Europe. In addition, it is also commercially grown. It is therefore available all over the world. It is a saprophytic mushroom, which grows in clusters at the roots of trees and stumps. It tolerates low temperatures very well, even those below zero. It is therefore possible to harvest it even in winter. Moreover, it is available as fresh throughout the entire year. Wild Enoki and artificially cultivated Enoki differ in their form, but not in their effects. Wild Enoki has a small circular slightly bulging honey-golden cap, which is a little sticky, on a thin velvet leg, which is about 10 cm high. Enoki grown without light access is white with pointed "unexpanded" caps. Enoki has been used for centuries to treat many diseases in traditional Chinese medicine. Written references about it date back to the Han dynasty. There are texts from the period of around 900 AD (si shi zuan yao), which describe in detail how to cultivate and grow Enoki, i.e. how to prepare a suitable growing substrate, how to water the mushroom, etc. Enoki was described for scientific purposes only in 1782, by M. A. Curtis, who classified it under the Agariceae and called it Agaricus velutipes. It was renamed only in 1951, when R. Singer reclassified it into the current group and gave it its new name, Flammulina velutipes. 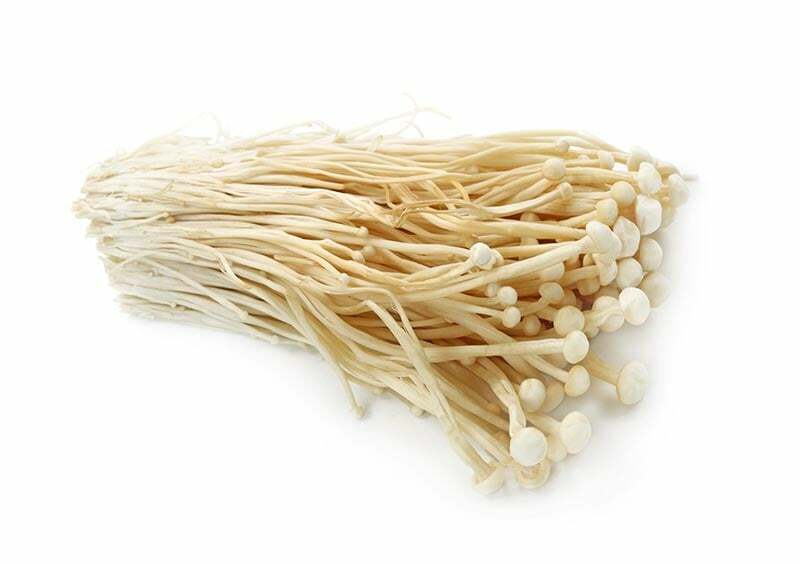 Enoki is a very tasty and versatile mushroom in the kitchen, which also has a great healing potential, described in more detail in the following text. But let’s start with the composition of the mushroom. Enoki should definitely not escape your attention, if you are thinking about doing something about your health, whether as prevention or improvement in the case of illness. Enoki can help you with many problems.